Alumni benefits include careers support from advice and guidance to continued professional development and online networking. Connect.ed is a secure and confidential online service that enables alumni to give careers advice to students and fellow alumni. Careers advice and support is also provided by members of our alumni community at events, online or through our networks and groups. Access the latest business knowledge through open courses at the Business School and receive a 20% graduate discount. Continue your professional development at the University with a postgraduate degree and receive a 10% graduate discount. Spend your summer studying in Edinburgh or at one of our international partner universities and take advantage of special rates for graduates. All recent graduates have full access to the Careers Service. 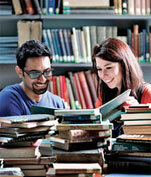 For older graduates the Service offers ongoing practical advice and information. The University’s short courses offer a fantastic opportunity to develop your knowledge and skill in a wide variety of areas with the added bonus of 10% discount for alumni.